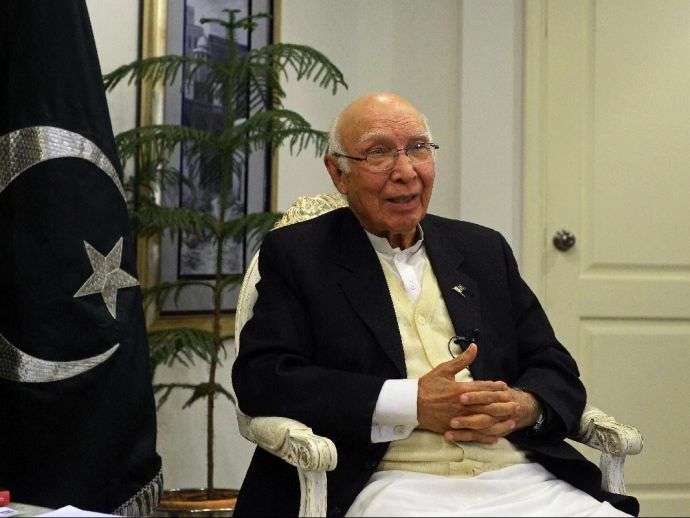 According to recent media report Pakistan PM Nawaz Sharif’s Foreign Policy Adviser, Sartaj Aziz, in address to the country’s senate conveyed that Pakistan Foreign Office has started to take multi-pronged strategy to Counter India Internationally. He said that Pakistani Missions across the World including in India has started to make efforts to reach out to Indians who are against the policies taken under Prime Minister Modi. He said, "Our missions abroad, including in New Delhi, are making outreach efforts to emphasise the extremist Indian policies". In his address, he tuned into the usual Pakistani strategy of playing the victim and blaming India policies and the reason of the present strain in relationship between two nations. He conveyed the senate of the formulation of a high level committee to "counter India's propaganda campaign" on Kashmir. The committee reportedly consists of officials from various branches of Pakistani Defence and Intelligence establishment. He also stated that to highlight the issue of Kashmir on various social media platforms, the Pakistani Ministry Of Information Technology has been asked to create a comprehensive strategy. Aziz is due to visit India for the Heart of Asia conference, which is to be held in Amritsar on December 3rd and 4th, this year.